Sled kites rely on wind pressure to keep the sail in shape, some not requiring spars at all, making them very cheap, and almost indestructible, except by dragging them through a convenient gorse bush after the wind dropped! They usually fly reliably in a light wind, though a poorly designed sled can deflate if hit by a sudden side wind, falling in a heap to the ground (or a gorse bush). 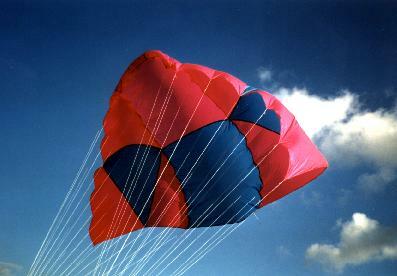 The first completely soft kite was the Rogallo, developed in the late 40's and the 50's by Francis Rogallo, following the theory that it would be better to make an aircraft which conformed to the flow of wind around it rather than expecting the wind to conform to the aircraft (or kite). It can be made out of a square of suitable material held in shape by a six-legged bridle. If you notice any similarity to a hang glider or to the delta sports kite, you'll realise that Rogallo's ideas have not simply been relegated to a backwater of kiting history. Both Eden and Pelham have plans for a rogallo. He continued his developments under the auspices of NASA, and the culmination was the NASA Parawing Model 5, plans of which are available. It's very easy to build in sizes ranging from a pocket kite to one that would pull like a train, given a bit of patience with the bridle. It can also be flown as a 2 or 4 line kite. Here is a picture of one built by Buck Childers. The basic sled has two longerons and a two-legged bridle. The two sides to which the bridle is attached act as keels, but even so, a tail or vents in the rear of the sail may be required for stability. The sled kite is a relatively new invention, dating back only to 1950. The original idea came from William Allison of Ohio with a tapering design, but a modified version was introduced in 1964 by Frank Scott, also of Ohio, who added vents in a parallel-sided design. The sketch shows Ed Grauel's version with trapezoidal vents. A very simple basic sled can be built out of a supermarket bag with drinking straws for spars, using Kel Krosschell's 2 cents Mini Sled plan. (Children can use sticky tape instead of the suggested heat gun.) Another plan is a replica of Grauel's sled, drawn from an example that was given to me. The ram-air sled dispenses with the longerons, replacing them by two air-inflated tubes. 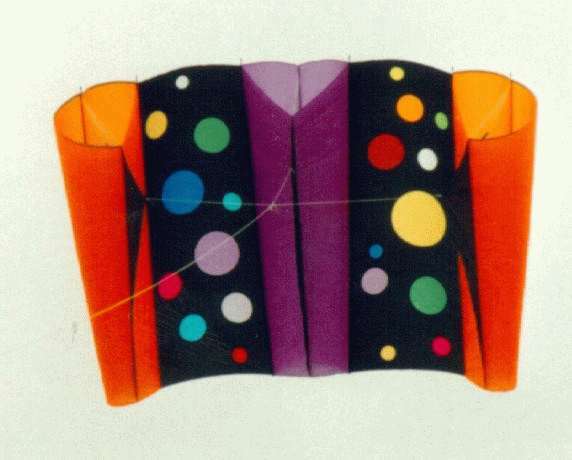 Having no rigid parts, this is a favourite design for a small child's first kite, but this is no reason why anyone young at heart can't stuff one in a pocket to fly whenever a breeze picks up. Buck Childers' plans (see my plans archive for a copy) make a good first kite to construct with a sewing machine. He and his wife make them for everybody for Christmas - hardly economic if you realistically cost your time, but there's something different about a present you made yourself. (I made 4 myself one Christmas - they take 3 hours each including an appliquéd initial). Alternatively, the Pan Flute kite, which consists of 7 air-inflated tubes, is a bit different. Anthony Thyssen has a picture of one he made. Or if you want something big, a plan was published in Kitelines Magazine in Fall '94, for a double ram-air sled, shown in this picture. The plans are also available online, in a somewhat downsized version.